Following the announcement of the visa waiver, which starts on June 17th, online searches for flights to Brazil increased as much as 36 percent from the four countries, according to President Bolsonaro. In exchange for the visa waiver, the U.S. indicated it may include Brazil as eligible for the Global Entry program. RIO DE JANEIRO, BRAZIL – Over the weekend, Brazil President Jair Bolsonaro took to social media to proclaim that the just-announced visa waiver for citizens of the U.S., Canada, Japan, and Australia has already produced measurable results in Brazil’s tourism sector. The waiver is scheduled to take effect starting June 17th. 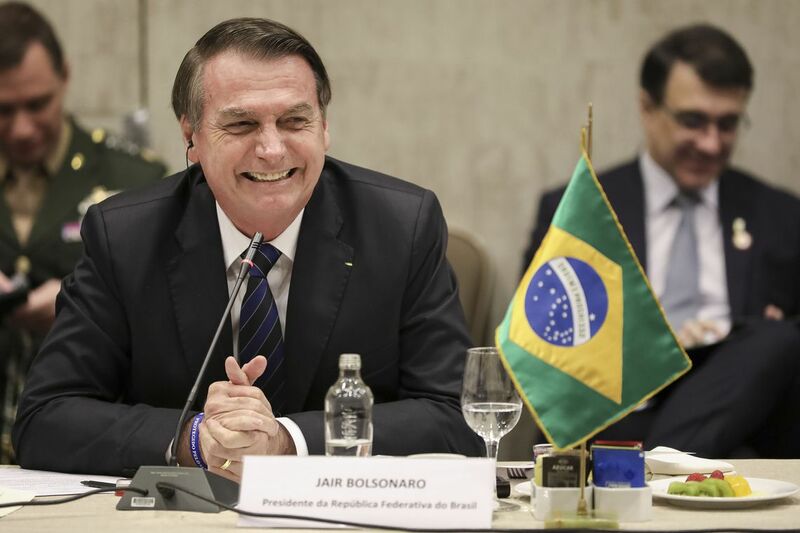 Presidente Jair Bolsonaro expressed his enthusiasm for the new visa waiver for the U.S, Canada, Japan, and Australia, photo by Marcos Corrêa/Agencia Brasil. The president then retweeted an article from the Money Times which showed that, immediately after the March 18th announcement of the visa waiver, the online travel booking platform Kayak registered an uptick in searches for flights to Brazil from the four countries. According to Kayak, from March 18th to March 20th, Australia showed a 36 percent increase in searches for flights to Brazil. The U.S. was next with a 31 percent increase, followed by Canada with a nineteen percent increase, and finally Japan, which showed a four percent increase. Brazil announced that it would be dropping the visa requirement for U.S. citizens during President Bolsonaro’s meeting with U.S. president Donald Trump last week. 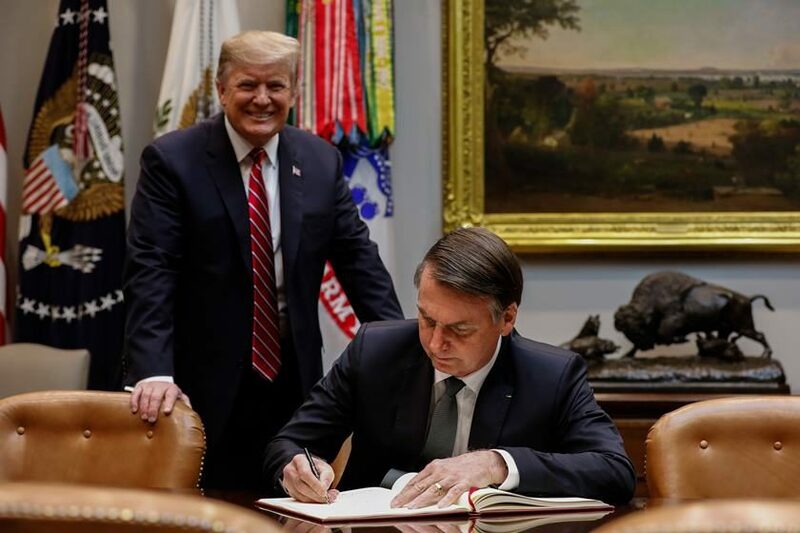 After the announcement, local media criticized the Brazilian president for not obtaining a reciprocal visa waiver for Brazilian citizens traveling to the U.S.
Brazil announced that it would be dropping the visa requirement for U.S. citizens during President Bolsonaro’s meeting with U.S. president Donald Trump last week, photo internet reproduction. While not a waiver of visa requirements, the U.S.’s Global Entry program allows frequent visitors from certain countries to enter the U.S. without having to go through immigration. To enroll in Global Entry, applicants must first file an application with U.S. Customs and Border Protection, and then submit to an interview and background check. Currently, citizens from eleven countries are eligible to apply for Global Entry: Argentina, India, Colombia, the UK, Germany, Panama, Singapore, South Korea, Switzerland, Taiwan, and Mexico. In recent years, Brazilians have been traveling to the U.S. in significant numbers. In 2017, 1.9 million Brazilians traveled to the U.S., the sixth-largest inbound tourist group visiting the U.S.
Brazilians are also among the highest-spending tourists to the U.S. Brazilian visitors to the U.S. spent R$7.1 billion in 2017, with each visitor spending an average of R$5,713 per trip. In 2016, during the run-up to the Rio 2016 Olympics, Brazil temporarily waived visa requirements for U.S., Canadian, Australian, and Japanese travelers to the country. Two years later, in January 2018, Brazil launched an e-visa program allowing U.S. citizens to apply for a Brazil visa online without having to go to the consulate. Would be nice if Canada reciproated. I’ma Canadian expat with a Brazilian family and it’s ridiculous what Canadian immigration wants. I can’t take my wife and son to visit my family there unless we have a crazy amount of money in the bank plus information on our home cars my wife’s employment. So we chose not to apply for a visa. Absolutely ridiculous.